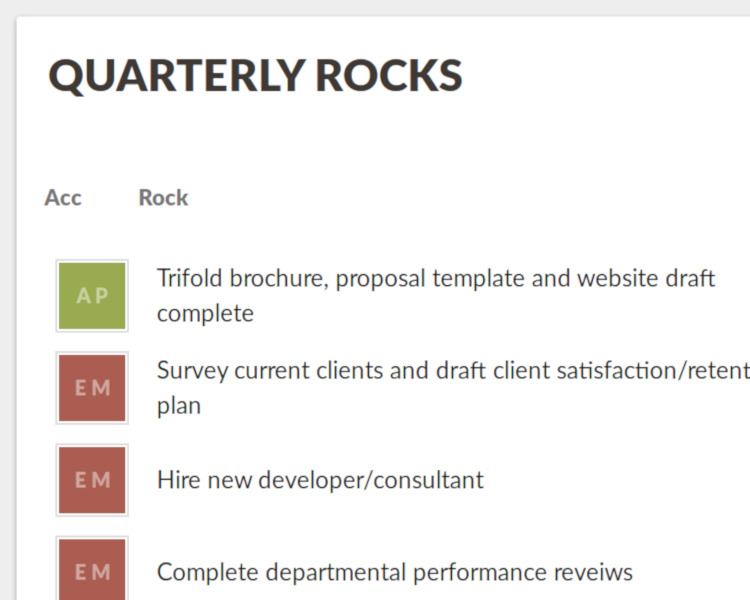 Now it’s easy to manage every Rock throughout your company. Traction® Tools Rocks helps your leadership team maintain accountability each quarter and gain Traction toward achieving your company’s 1-Year Plan. Traction Tools EOS® software automatically adds Rocks to the Level 10 Agenda when they’re created. Company Rocks are automatically added to the V/TO™. Need to look up a Rock? You can see it in your Level 10 Meeting™, or view your individual and company Rocks right in your Traction Workspace™. They’re always right where you need them! EOS may be simple, but it’s not always easy to maintain focus on your Rocks each quarter—and it can be tough to stay on track or hold people accountable. At Traction Tools, we want your company to get the most out of your Rocks. So we built our EOS software application to help your company master the Traction® component of your business. Start your free Traction Tools trial to see how easy it is to track and update EOS Rocks. Sometimes a Rock has implications for another team or department. Our EOS software makes it easy to share Rocks with other Level 10 Meetings. Just enter the data once, and keep track of the Rock’s progress in both meetings. What happens if a Rock owner moves to a different seat or leaves your company? We’ve made it easy to maintain accountability by reassigning Rocks to a different person. You’ll never have to worry about an orphaned Rock that falls through the cracks.